I was four years old and wide-eyed, perhaps especially if snow was falling. Almost nothing was better than snow in my early years, and I whined until I was permitted to go outside and roll in it. I made no calculation about whether it was deep enough to roll in without getting muddy. Besides, what difference did a little mud make? Even a small accumulation of snow was a powerful, powerful magnet. The magnet and all that whining finally drew me outside. I was doing what I did when my mother appeared on the front porch to call me back inside. She was crying. Even at four I knew something was wrong. Moms don’t cry unless there is a good reason. The date was Nov. 22, 1963. It was the day I came to know that Walter Cronkite was a very important man and that there were other important men on two other channels. President Kennedy had just been assassinated in Dallas, which I assumed was a faraway place. It was the first time I’d ever heard the word assassinated. At four, I knew that Kennedy was the president; I didn’t know what it meant for certain, but I knew that he was sort of like the maximum boss and always was to be treated with the utmost respect. My Grandma was there. She was crying, too. We watched TV pretty much for a week straight. I remember John-John, a boy even younger than I. And I remember the horses at the funeral. I was scared they might take off and ruin things. Horses do that sometimes, but they did not on this occasion. Walter Cronkite later took me to the moon; the 40th anniversary of man as an extraterrestrial is Monday. Walter couldn’t believe it in 1969. Neither could I. I’m 50 now, and I’m still blown away by it. I never look at the moon without thinking people actually have been up there. Those same people are part of a species that ferried itself on foot, boat or horseback only decades earlier and made it possible for me to publish a Blog accessible virtually worldwide only decades later. Cronkite and President Kennedy. Cronkite and the moon. Next came Cronkite and Watergate — at least in terms of what is seared in my mind. Truth is, though, Walter is tied to history in so many ways that a person of a certain age group can pick and choose from many, many moments. Walter and Martin Luther King, for example. Walter and Vietnam. Walter and World War II. Walter and the Russians. Walter, associated with serious events, had a sense of humor. 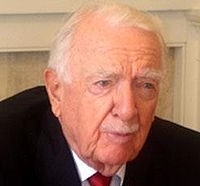 The President of the United States dropped everything he was doing last night and issued a special statement on the life and the passing of Walter Cronkite. An American treasure: Walter Cronkite. Nov. 4, 1916-July 17, 2009. We’re about the same age Patrick, and as my father once told me that when he was a kid, FDR was the president and had been forever and would be forever, people our age thought the same way about Cronkite. He was the news guy forever, and he would be forever. Of course, when we were growing up, the news was an hour every night, after dinner. We didn’t have a 24 hour 200 channel beast that makes the media the circus it was today. We had Walter, and two other guys (John Chancellor was one, the other escapes me), knowledgeable serious men. Now of course, we have a media machine that constantly has to be fed, and in order to fill the air time we have trained chimps and airheads, and I for one have gone from not paying much attention to aggressively ignoring the news because of it. How many times these days to we get these yahoos acting like experts on subjects they nothing of, except what they read on the internet during show prep? How many populist idiots are on the air, like Glenn Beck ranting about the fact that the Federal Reserve is not responsible to Congress? (imagine for a minute Congress trying to set monetary policy) I won’t even get into how CNBC created a class of thousands who now know enough to trade (not invest) stocks and tens of thousands who think they do but don’t. The price of progress is now we get to filter the mass of information that is important, we get the raw feed now. Getting the raw feed means we have to put up with the garbage, the nuts and the crackpots, to get the stuff that matters. I long for the days when Walter Cronkite and his kind did the work for us and after 58 minutes he would say “And that’s the way it was…” and we all believed him. It’s true: When Walter signed off with, “That’s the way it is,” people did believe him. His greatest contribution, I think, was shaping the discussion. The newscast enlightened and informed because Walter presented the facts. People emerged from the broadcast with things to think about. Walter made no secret about his dislike of the 24-hour cable news cycle and all the chatter needed to fill it up. I’ll always be a news junkie, but there are some cable folks who are just too painful to watch. I don’t mind a cable channel having a point of view. What I mind is the shrillness. Another thing I admired about Walter is that he insisted that his reporters actually do the reporting, rather than farming it out to a junior researcher or relying on a producer. I’ve seen some TV people fussing over their hair more than worrying about whether they were getting the story right. Sometimes looking good on TV is viewed as more important than getting it right. Walter must have detested that. P.S. The anchor you weren’t able to recall on the fly perhaps was Howard K. Smith or Frank Reynolds. Ah the memories. Chet Huntley & David Brinkley, Frank McGee, Eric Sevareid, Jules Bergman, Peter Jennings, Frank Reynolds, Howard K. Smith, John Chancellor, were my favorites. What an era it was, and too bad we cannot find the same quality of people now. I’m sure if they did the networks ratings wouldn’t be plummeting like they are now. Patrick: Made a typo, it should be Ah, not Aw. I got my tongue in front of my eye teeth and couldn’t see what I was typing. Thanks for correcting it. I agree with the news comments…..however I can now read Le Monde, Times of India and any number of papers online if I wish. My news choices are not left up to a few editors in my home town or a few at the networks. I can get just about anything on demand if I choose. I had all the Kellog’s Corn Flakes NASA patches, drank Tang and ate space bars. I must be a space geek cuz I am listening to the real time replay of the full Apollo 11 mission. Everything is relative, at least it is now. Perhaps it’s a fragment of memory harkening back to a more innocent time but I trusted Walter Cronkite in a way I can’t even imagine trusting someone reading the teleprompter on a major corporate news program today. Does that say more about me than it does of the media culture? As I said, it’s relative. Cronkite retired before I graduated from high school, he had been the voice of the news for as long as I can remember hearing it but he stopped at about the point I could begin making any real sense of any of it. It’s been said that journalism is the first draft of history, in my most formative years Walter Cronkite was the voice (and face) of journalism. I’m a jaded cynic (but not hopelessly so) so the fact that no voice in the news arena commands my attention the way that Walter Cronkite did says less about the times we live in than it does about myself. But the fact that no voice in the news arena commands anyone’s attention in the way that Walter Cronkite’s did does. We went from “the way it is” to “what’s the frequency Kennith” and turned sharply south from there. I actually felt bad for Dan last night. He was like a man without a country. Strange night it was. Dan was on MSNBC. Larry King actually ended up being a guest on his own show, which was being guest-hosted by John King. GlimDropper: But the fact that no voice in the news arena commands anyoneâ€™s attention in the way that Walter Cronkiteâ€™s did does. Except for Rush Limbaugh over the past 21 years – where Rush does a 3-hour monologue each day, based upon the news of the day. dirty_bird: I must be a space geek cuz I am listening to the real time replay of the full Apollo 11 mission. Thanks for including those links and for the glimpse into U.K. culture. We get some U.K. television over here now, and if a person is willing to pay more, he or she can get more. That’s a relatively new development. There was no U.K. television here for a long time. Basically our only exposure to the BBC, for example, was from encyclopedias, history books and wire stories that quoted the BBC. Other than through books, my exposure to British culture came largely though the Beatles in the 1960s and later through some programming on public television (PBS) here. That started to change in the 1980s. We started to get plenty of news about Margaret Thatcher and, later, more news about British/European politics in general. Prime Minister’s Questions is a fixture here now on cable. Guess they forgot a journalist job is to report the news, and the school’s job it to teach them how to do it. So, You Want To Push An Autosurf And Tell Your Prospects You’ve Performed ‘Due Diligence’ On The Operator?